Yesterday, I shared my experience of being in a Carnival Krewe and riding in a parade. 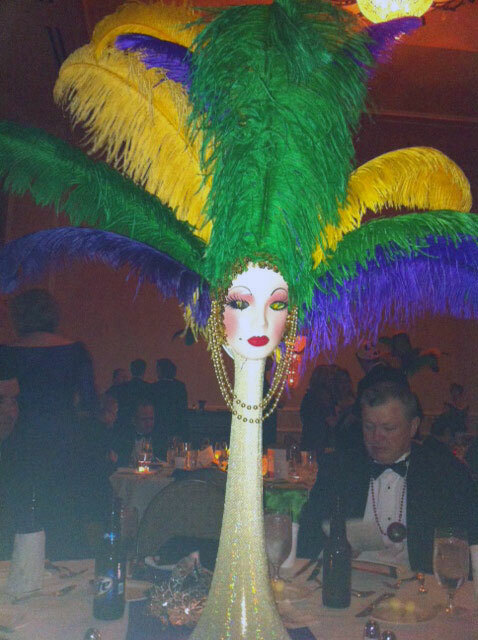 Today, I wanted to show you some of the tables from a Masquerade Ball. 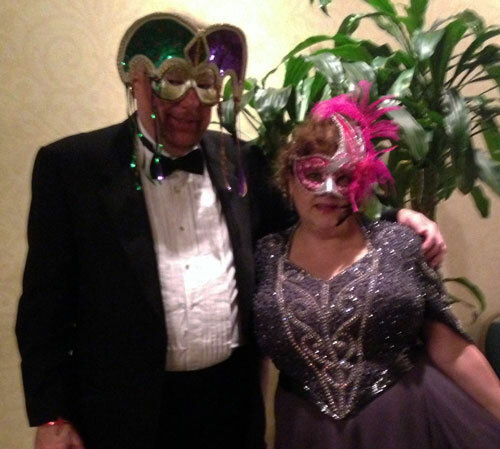 This is a fun event with everyone dressed so elegantly in their ball gowns and tuxes. Masks are required and must be worn until dinner. 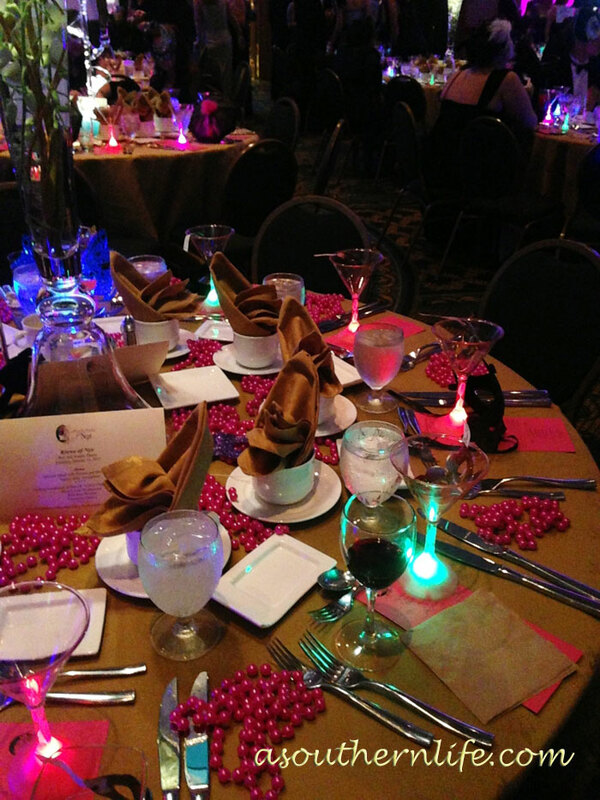 Here is the beautiful ballroom, decked out for the ball. 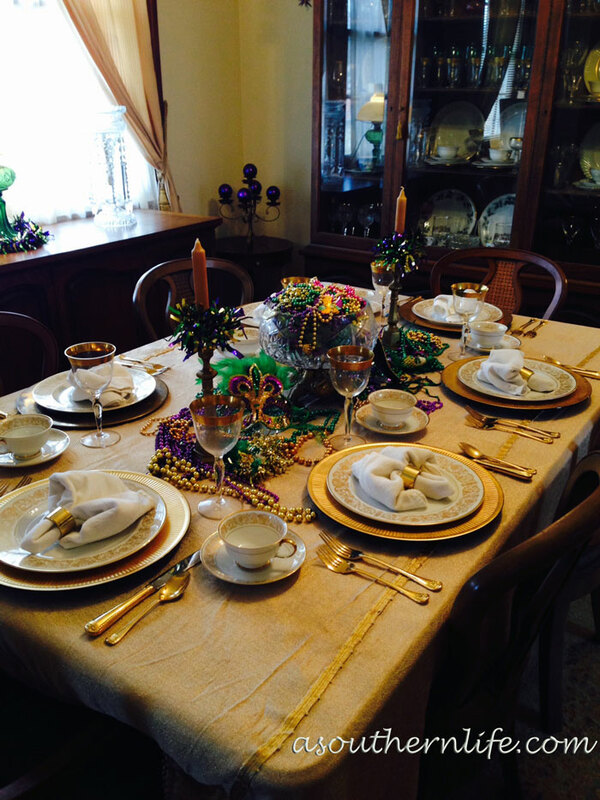 Notice the fleur de lis napkin folds and the beads along side each place setting. Also, the cute light up martini glasses are at each place and were given as a one of the favors. We are in the full swing of Carnival here in New Orleans. The beads are flying, the bands are marching, the floats are rolling, and it is truly something incredible to behold. 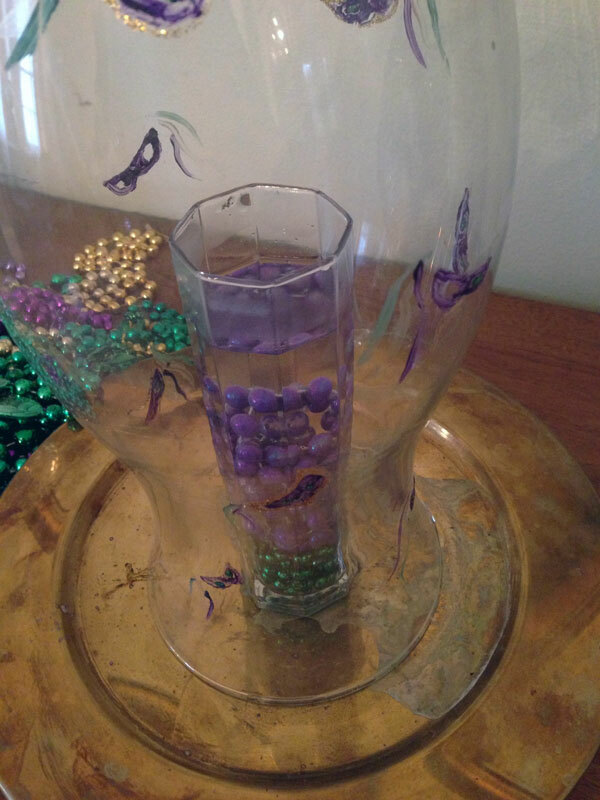 As I mentioned in a past post, I was lucky to get to be a part of the fabulous Mystic Krewe of Nyx when I first moved to New Orleans. Nyx will roll Wednesday night. People have asked me about that experience. So today, I am sharing the experience of being a part of a Carnival Krewe and riding in a Carnival Parade. One of my favorite things about living in New Orleans is taking the opportunity to be a tourist in my own town. There are so many things to see and do. I also love watching visitors enjoying this unique city. One of the places that locals enjoy is City Park. It is also visited by many tourists, and it is certainly worth the short ride on the streetcar. 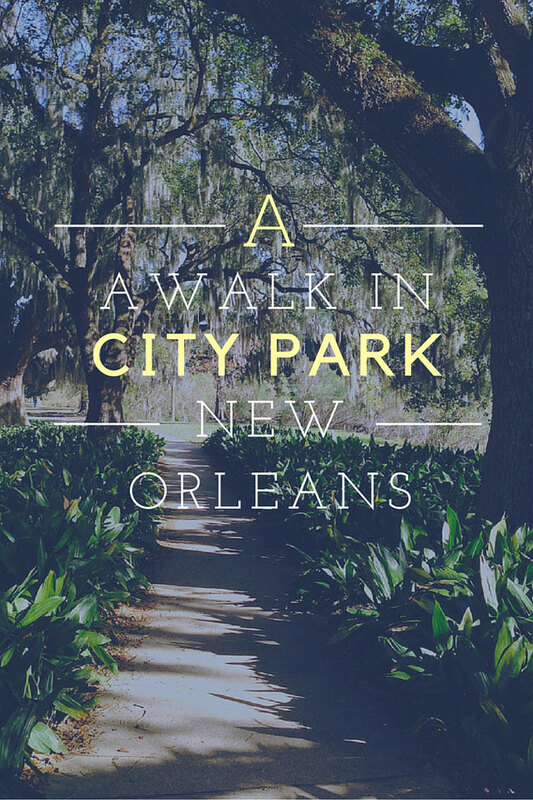 City Park is a 1300 acre oasis in the heart of New Orleans. The lake and bayous that meander through the park afford visitors with the opportunity to see incredible wildlife, including swans, geese, ducks and turtles. I saw all of these on my recent visit. You will see beautiful oaks dripping with Spanish moss, colorful flowers and lush, tropical green plants. The park is home to botanic gardens, an amusement park, a putt putt range, the Big Lake with paddle boats and canoes. It is also the home of Morning Call where you can rest and refresh with cafe au lait and beignets. 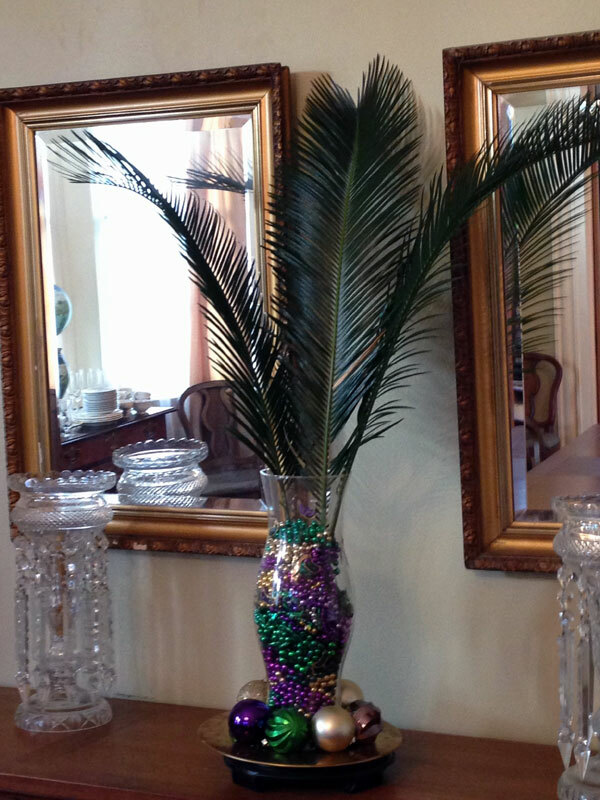 It’s always fun to set a table for Carnival. 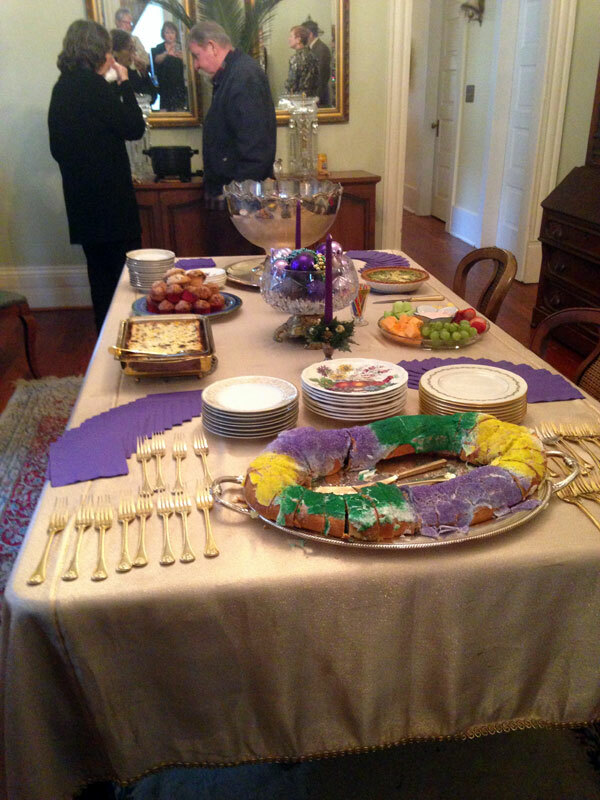 Lots of beads, a couple of masks, napkins folded as fleur de lis, all set the china and crystal aglow. Come have a seat at the table and see what fun we can have . 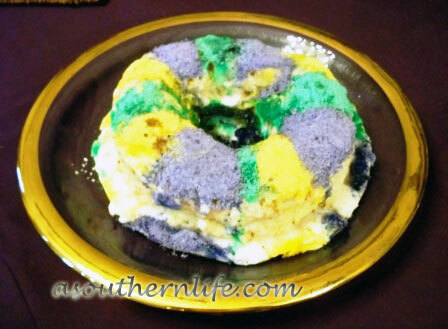 . .
Just in case you haven’t had enough king cake yet, here is another helping. I saw an article on NOLA Eater the other day, discussing some of the incredible variations on king cake. There are king cake donuts, king cake floats, king cake pancakes, king cake soda, king cake vodka (yes vodka), and the list goes on. Apparently, there is no end to variations on the king cake theme. 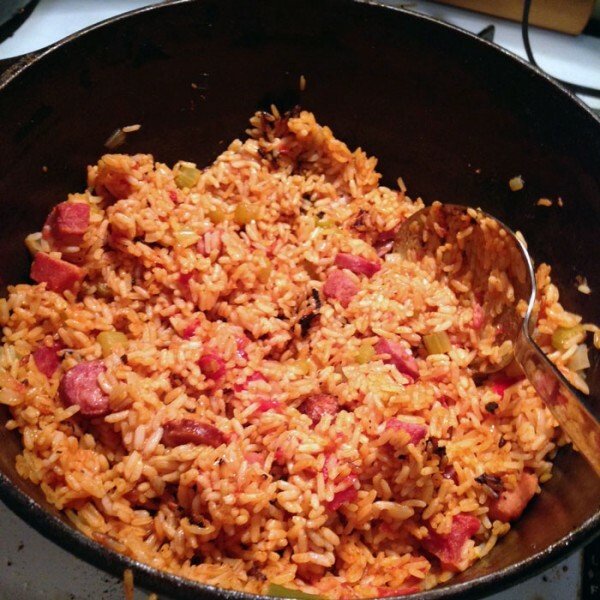 With that in mind, I searched through my own cookbooks and looked at recipes online to come up with a basic king cake dough that can be filled with any number of fillings. This cake is light and tender and oh, so good! Stir yeast into warm water in a small bowl and set aside to proof while you gather other ingredients. Turn dough out on to a floured surface. Dust with flour as needed to enable you to roll out the dough. Roll the dough into a rectangle (this is for a large cake - if you would like 2 smaller cakes, cut the dough in 2). Spread filling on the dough leaving a little space on the edges. Roll the dough (starting from the long end) and form the dough into a ring, pinching together the seams and the edges. Let the formed dough rise for until double - about 1 hour. Bake at 350 degrees for 13 to 15 minutes. Let the cake cool. Mix together the powdered sugar with enough milk to create a spreadable glaze. Add lemon extract to the glaze. Spread the glaze on the cake and sprinkle with the colored sugars. The filling for this cake is traditionally a cinnamon and sugar mixture. For that filling, spread softened butter on the rolled out dough and sprinkle with cinnamon sugar. I filled the cake with a cream cheese mixture which was 8 oz. softened cream cheese and 1/2 brown sugar combined. You can fill this cake with whatever you like. You might try an apple pie filling or a praline filling. I've seen cakes with a banana filling and a caramel glaze. So many possibilities . . .
One note: It is best to plan ahead. Get your ingredients out early and bring everything to room temperature before you begin. Make sure the butter and shortening are soft so they will incorporate easily into the dough. When I first moved to New Orleans, I was very fortunate to be told of a new krewe that was starting by the fabulous New Orleans tastemaker, Kim Este. I met Kim through another wonderful lady, Christy Keirn. 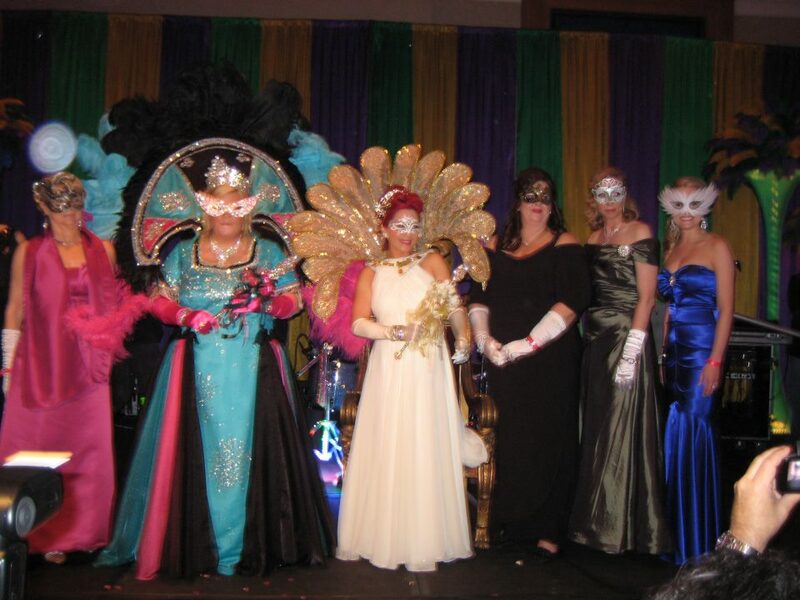 The krewe I joined is now one of the hottest, female krewes in New Orleans, known as the Mystic Krewe of Nyx. I rode with these incredible ladies (and Kim was my float captain) for two years. During those two years, I met so many wonderful ladies and enjoyed a great Carnival experience. I also met ladies, who were not part of a krewe, who expressed their longing to be in Nyx. So many have always dreamed of being a part of such an organization. So, after two years, I decided to give up my position in Nyx so someone else could enjoy it. What a wonderful experience it was to be a part of such an great group of ladies! I learned so much and had a great time. I hope whoever took my place enjoys it as much as I did. My husband and I at the Nyx Myx Masquarade Ball. 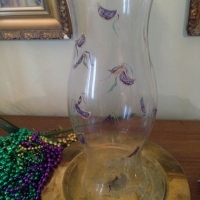 Mardi Gras is right around the corner, and the parades will be starting soon. Today, I’m going to answer some of the questions that I have gotten about Mardi Gras in New Orleans. Looking for a nice little bite to add to your cheese plate? 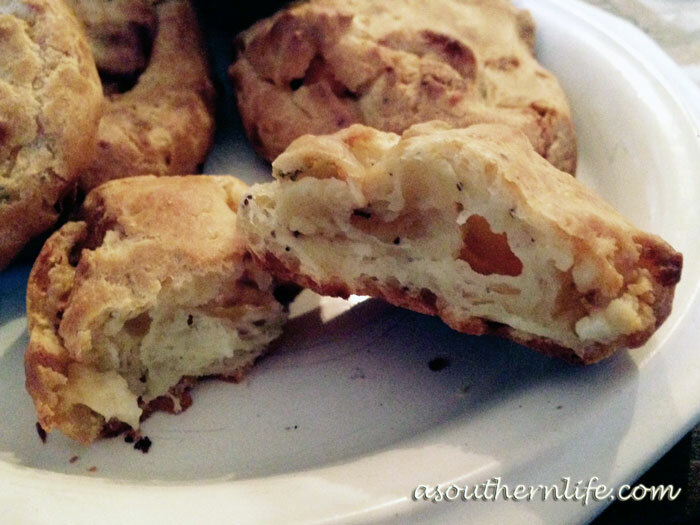 I love making these tasty little cheese puffs – filled with blue cheese and herbs from my garden. Of course, you can switch out the cheese and herbs and make this into anything you like, but you really need to try this. A simple pate a choux dough with cheese and herbs – what’s not to love? Melt in your mouth delicious little pate a choux pastry puffs bursting with blue cheese. Preheat oven to 450 degrees. Bring water and butter to boil. Add the cup of flour all at once and mix it with a wooden spoon until the dough pulls away from the pan in a ball and forms a thin film in the pan. Remove the dough from the heat. Add the blue cheese, Dijon mustard, pepper and herbs to the dough. Transfer dough to a mixing bowl and allow to cool for a few minutes. Beat the eggs into the mixture, one at a time, with an electric mixer, using the paddle attachment. Place parchment paper on baking sheets. Scoop dough onto the baking sheets, one tablespoon at a time, using a tablespoon cookie dough scooper. puffs into oven and bake for about 10 to 15 minutes, turn heat down to 350 degrees and bake for another 10 minutes. Turn oven off and allow pastry to dry out until the oven is cool (another 10 to 20 minutes). Remove baking sheets from oven and enjoy! These also freeze well so you can make them ahead of time! Bird of Paradise – It Finally Bloomed! 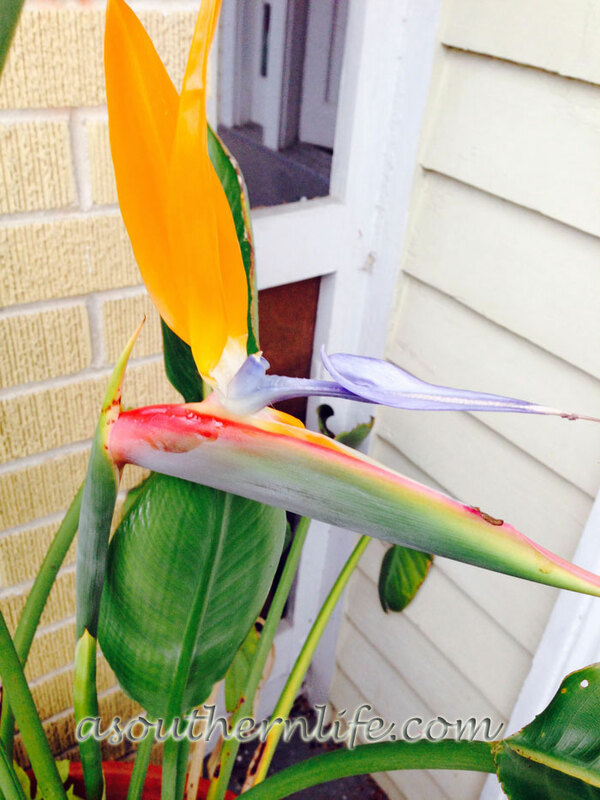 I wrote some time ago (before I moved to New Orleans) about my bird of paradise plant. When I got the plant, it was with the knowledge that it may not bloom for up to 7 years. Sooo, I have nurtured this plant and moved with this plant (and broke the pot it was planted in during the move), and have patiently waited. I actually can’t even tell you how many years it has been, I lost count. It has probably been close to the full 7 years and now, finally, it bloomed! 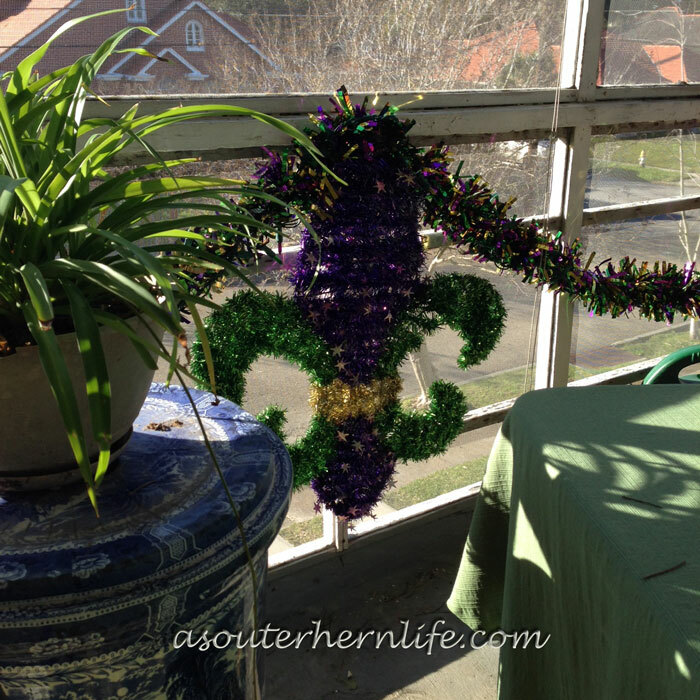 January decor in New Orleans means Mardi Gras (or Carnival – but that is another post). 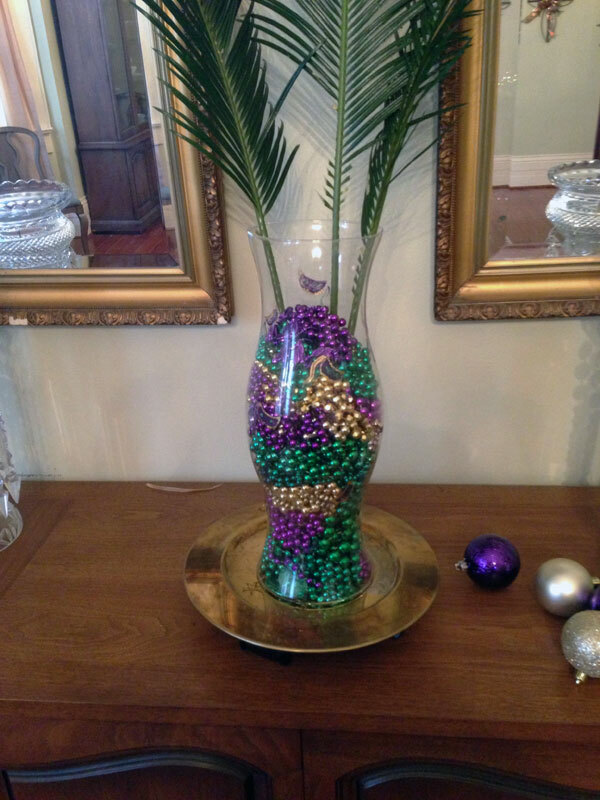 With the Mardi Gras colors of purple green and gold – which we got from Rex – we paint the town. It is sparkly, it is bright, it is colorful and it is fun. 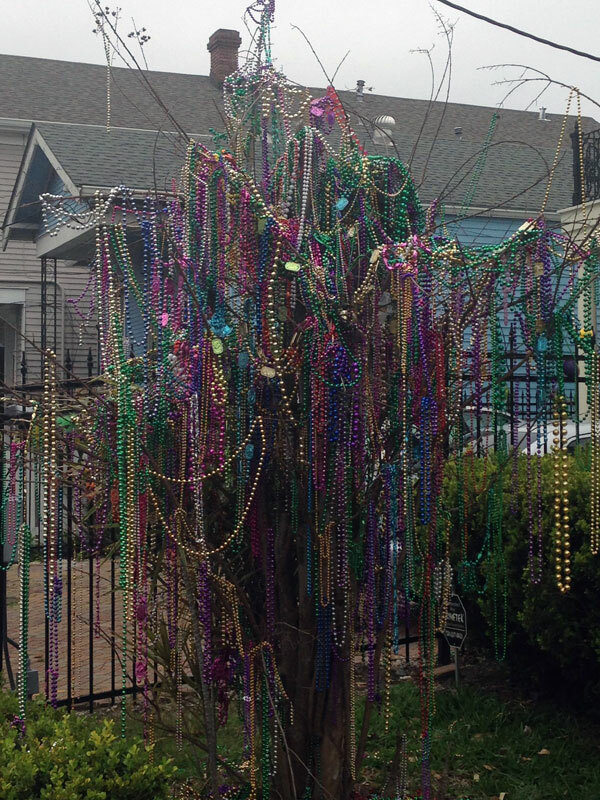 In a lot of places, the decorations of carnival, might seem too flashy or gaudy, but in New Orleans, it is just part of the normal landscape. Doesn’t everyone have a tree like this in their yard? Here are a few decorations around the house . . . 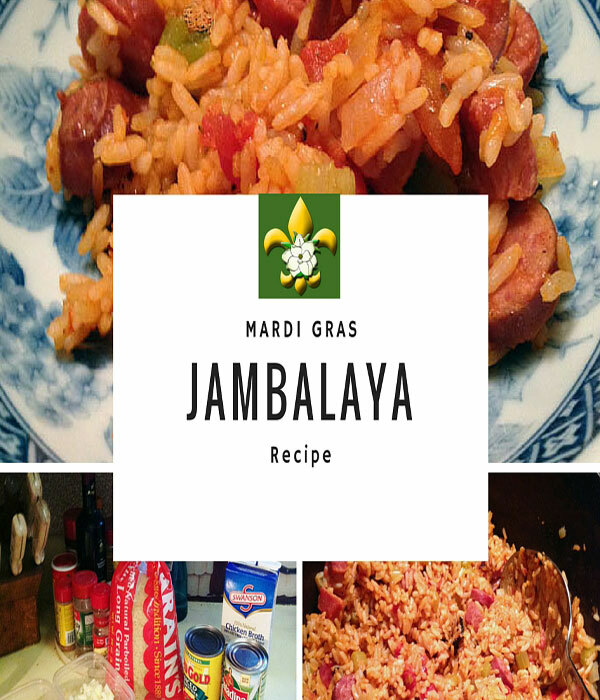 I call this Mardi Gras Jambalaya for a couple of reasons. One, it is Carnival time and the other is it colorful and bold – kinda like Mardi Gras. 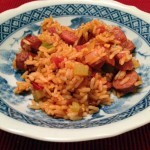 This recipe is based on a recipe by the great Chef John Folse. I first learned of the trinity (onion, celery, bell pepper) from Chef Folse when I used to watch him on PBS back in Arkansas. He has some great books that include fabulous recipes but also a great deal of fascinating history about Louisiana and it’s people. So like New Orleans. . . in most places, people have put away their Christmas decorations and started their New Year’s diet. In New Orleans, while the Christmas decorations may have been put away, we have put up the Carnival decorations and everyone is eating king cake! So many traditions, so much yummy goodness. Now that Twelfth Night is past, Carnival is in full swing. So… it is king cake all the time. 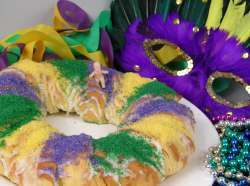 King cake is traditionally a brioche dough that has a cinnamon filling and is rolled up and shaped into a ring, which represents the crowns of the kings (wise men). 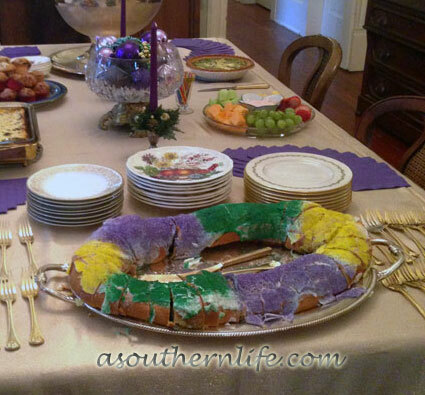 Today, the king cake may be filled with anything from cream cheese to fruit and nuts. They are drizzled with frosting and sprinkled with colored sugars. 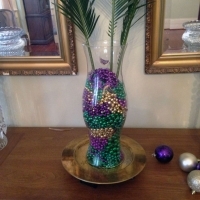 The three colors of sugar are Purple (representing Justice), Green (representing Faith) and Gold (representing Power). 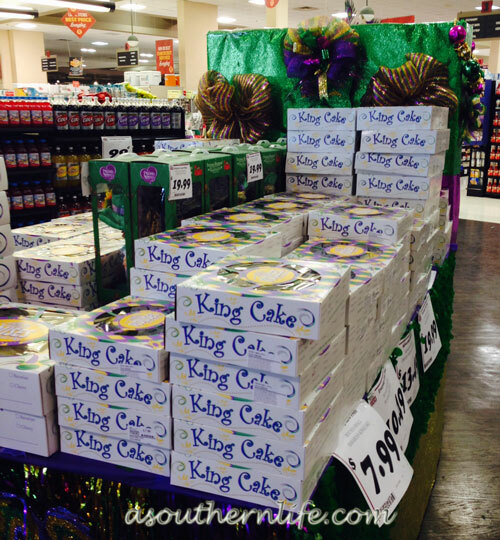 Even before Twelfth Night, we began seeing king cakes for sale in our favorite stores. 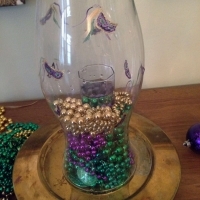 The king cake parties begin on January 6th and continue through Mardi Gras. In each king cake, a small plastic baby is hidden. Whoever gets the baby is bound by tradition to furnish the king cake for the next king cake party (or at least supply the next king cake at the office). In times past, the baby may have been made of porcelain, or even gold. In some places, the baby is replaced by a simple bean. If you can’t run to your local grocery and pick up a king cake, you can always make your own. 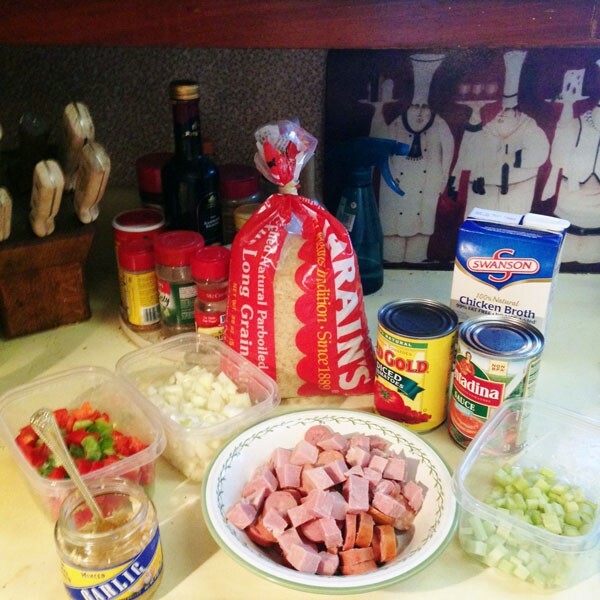 Here is a recipe in a past post for a no bake king cake – a tasty short cut! 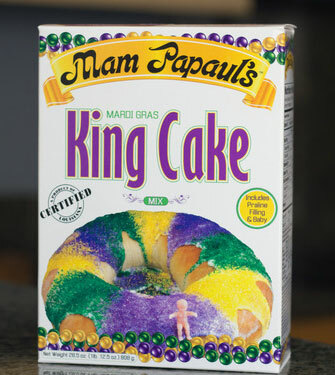 There is also a great king cake mix available here that you can use. 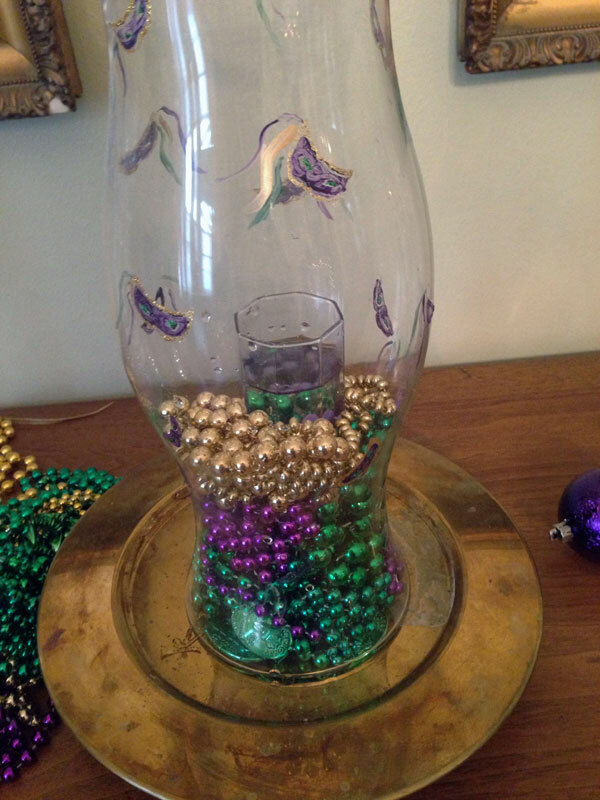 When I lived in Arkansas, I got one of these mixes online and made it for my Mardi Gras party, and it was a huge hit. Happy Carnival everyone . . . hope you get to enjoy some king cake this year! If you would like to purchase the king cake mix, click on the picture above. So this Wednesday is January 6th which is the date of Twelfth Night, also known as Epiphany. 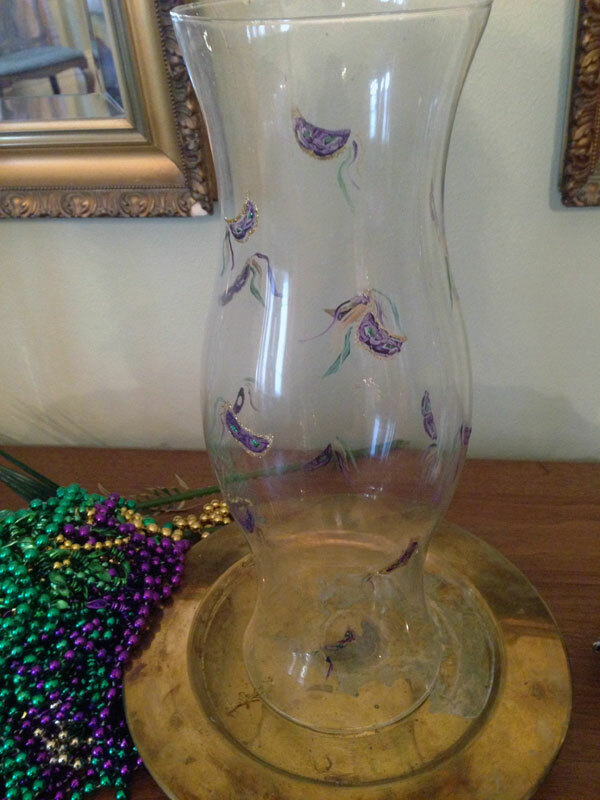 In New Orleans, it is the official beginning of Carnival season and we kick it off with a few parades and parties and the consumption of King Cake. Twelfth Night is the end of the Christmas season and it is when, traditionally, the Christmas decorations come down – and the Carnival decorations go up. Here are some scenes from around New Orleans on Twelfth Nights past . . . 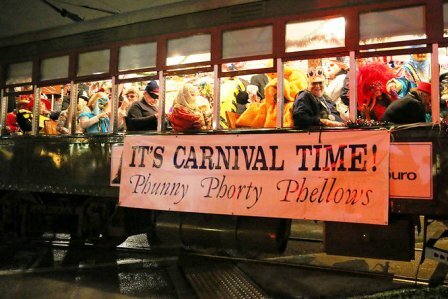 The Phunny Phorty Phellows start their party at the streetcar barn and then take the party on the tracks as they roll down St. Charles Avenue. Thirty years ago, a group revived an old organization that had been active from 1878-98. 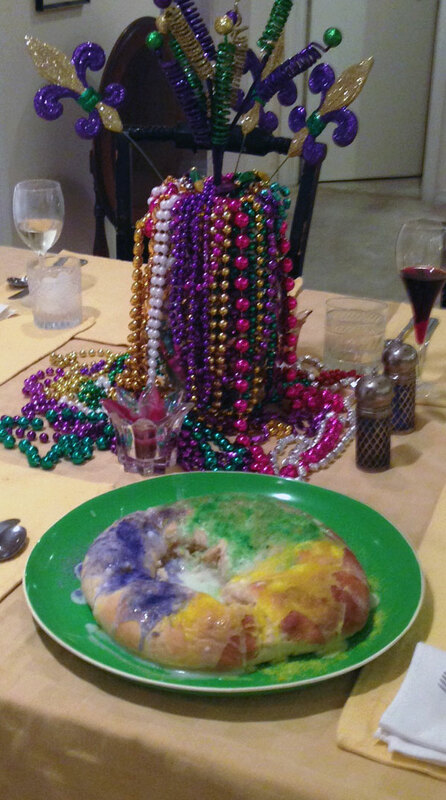 The King Cake is decorated with the traditional colors of the Carnival season. Purple represents justice; green, faith; and gold, power. The parties begin . . .
and then their are the balls . . . So, it begins . . . here we do – Carnival 2016! Want to celebrate Carnival where you are? Get some King Cake mix and throw a party. There is a baby hidden in the cake and whoever gets the baby throws the next party and you just keep it going until Mardi Gras which is on February 9th this year. Wondering where to get your Carnival supplies? Starting Wednesday, January 6th, check back here at asouthernlife.com. 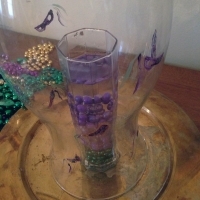 I’ll have king cake mix, beignet mix, carnival pins, beads, masks and more here for you to purchase. Can’t wait to open the new estore at A Southern Life! What’s new where you are? I’m linking to Metamorphosis Monday at Between Naps on the Porch today.